These increases look silly now--but these little gussets do a lot to improve fit. In this case--I am doing an afterthought heel—but the same gussets work for other similar type heels—like short rows ones—all sort of short row ones. The method is simple enough. About a half inch before the beginning of the heel, INCREASE. On the front/instep side—at the beginning, K1, M1. 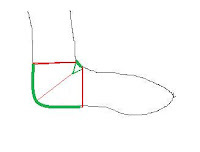 Then work across the instep, till 1 stitch remains on the instep, then M1, K1. Most often I do about 5 sets of increases (over 10 rounds) and since my gauge is about 8 stitches to the inch, these 10 stitches add about 1.25 inches to the diameter of the sock. 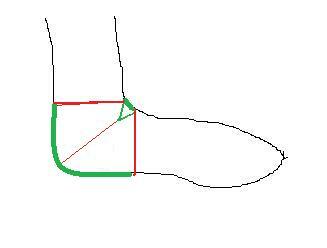 One to 3 rounds plain (to fine tune the placement of the heel)--and then decreases in a like manor—K1, SSK at the beginning of instep, K2tog, K1 at the other side of instep—again, working decreases every other round. If you measure from the heel to the top of the instep, you'll have a bigger measurement—for me, its 12.25 inches. The Diagonal line (about equal in length to the vertical and horizontal lines)falls short. It doesn't take much in LENGTH to span the arc on the top of foot—these small gussets are LONG enough—and while there is (in theory) still not enough ease –my foot measures 12.25—the gusset only--1.25 inches of extra material—it actually does work because the shaping of the heel adds some 'invisible ease'--for many though, (if not most people) the small amount of ease created by the heel is not quite enough ease. The gusset makes up the extra. 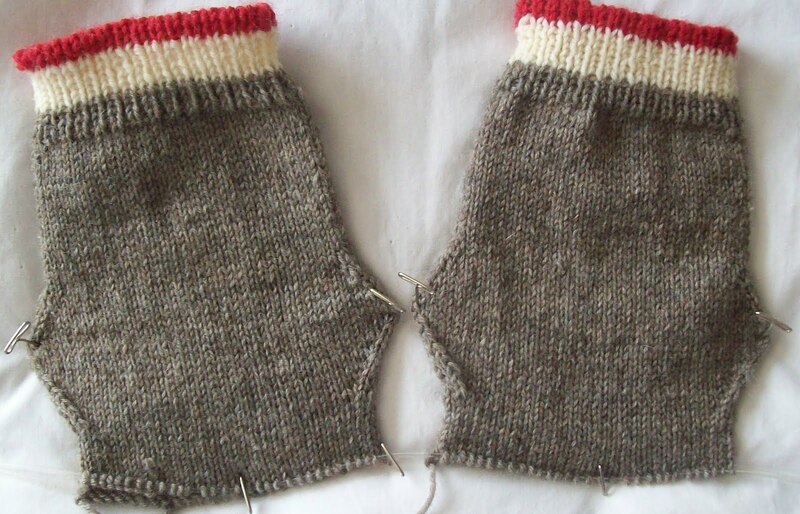 Gussets like this are so simple—and for self striping patterns, these extra 10 stitches (max) aren't enough to seriously disrupt the striping pattern. It just about 2 inches (of a needed 5 /5.5 inches) now past the row of waste yarn for the heel placement. These socks are moving along!